It's always a little bit hard to recap a weekend where we did a million and ten things, but I'm gonna try. Hopefully it will not require a million and ten words. Hubs and I flew to Charleston on Thursday morning and I feel I must digress here for a minute and tell you that I cannot even remember the last time I took a flight inbound or outbound from Newark that was not delayed. ahem. Moving on...Daughter 1's fiance graduated from medical school on Thursday evening, and we were so happy to celebrate with his family as he walked across that stage, the letters M.D. now officially behind his name. Also now officially a Captain in the US Army, because gaining his M.D. meant a promotion in rank. Whoohoo! Choosing to become a doctor is not a small thing, it truly is a commitment to a lifetime of dedicated service and continued learning. Next on the agenda is a five year residency, which I'm pretty sure is not a walk in the park either. He's excited and brilliant and so looking forward to this next chapter with our girl by his side. You can see Fort Sumter from the water's edge. We didn't get out there this trip because you can only do so much in a single weekend, but another time I hope. The Civil War began at Ft. Sumter, so lots of history round every cobblestoned Charleston corner. It's pretty peaceful here now. ...followed by a delicious low country lunch in a well known restaurant called Poogans Porch where we dined, appropriately, on their lovely upstairs porch. Funny story-standing in front of me when I stepped into the restaurant was a sweet friend I met via my blog. M lives in North Carolina and came to stay with me back in October along with another friend I'd met via my blog. She happened to be in Charleston for a couple of days with her daughter and another friend and we both ended up in Poogans Porch at the very same time. 'It's a small world after all....". Everybody sing! Also you should know I'd just stepped off a carriage and it was breezy so my hair was crazy. I had a fried green tomato BLT sandwich with crab remoulade and it was positively delish. 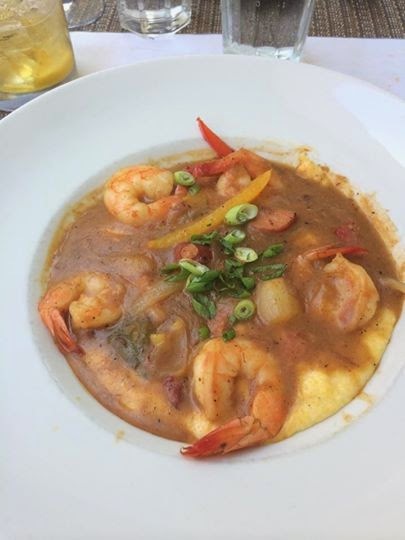 Hubs ordered their shrimp and grits, a dish he'd eaten for breakfast just a few hours earlier in another spot, but when in Rome, right? NJ is not known for her shrimp and grits, so he fills up when he's down south. Plus, there are many variations to the recipe so it's not like you're actually eating the same dish twice. We agreed we should not live in Charleston because when someone sets a warm from the oven biscuit in front of you it's hard to say no thank you. Fortunately we logged a lot of walking miles this weekend! Friday night we ate at Hank's Seafood which is another well known spot, famous for its seafood and maybe shrimp and grits, but we both had seafood. It was just the hubs and I, but we sat at a community table with people from Kansas City and discussed our mutual love of good BBQ. Food really is a universal language. On Saturday we had a light leisurely breakfast in the East Bay Meeting House, a small coffee shop in the French Quarter that made me think of Europe. The fiance's family were all staying in a house over on Folly Beach, and had invited us to join them for a lunchtime low country shrimp boil. I promise we did more than just eat all weekend. That felt like it needed to be said. The 'kids' picked us up, and we had an enjoyable afternoon chatting and getting to know his family a little bit better. There was boiled shrimp and baked grouper, corn and potatoes and a wonderful salad. This post is a little heavy on food shout outs, but in all honesty, you can't go to Charleston and not talk about the food. At least I can't. Saturday afternoon we drove back into Charleston so the fiance's sister's and her boyfriend, and another family friend could play tourist. The sister's boyfriend is not a local, so he wanted to see some of the area's historical sites too. The homes in this town are to die for. Seriously, I could just move right in, plop myself with a good book onto one of the umpteen covered porches and stay for a while. I'd noticed a hotel's rooftop from the street level and wanted to check it out in person so Hubs and I, along with Daughter1 and her Dr. Captain rode the elevator all the way up inside the Market Pavilion Hotel late Saturday afternoon. The hotel lobby is quiet and elegant, so that's more or less what I was expecting to find rooftop. The elevator doors opened and Whoa! There's a pool! Literally right in front of you! And lots of people and tables with umbrellas. It was lively and fun and the sun was shining so we sat up there soaking it all in. We talked and took pictures and enjoyed the lovely temperatures and maybe a glass of bubbly. There were views all across Charleston from up on that roof. Saturday night we met Daughter1, the fiance, and his parents at a lovely restaurant called 82 Queen. The restaurant's dining spaces are spread amongst three buildings with a beautiful patio in the center of it all. Our table was in a gazebo on the patio where an enormous magnolia tree grows, and the food and ambiance were delightful. Hubs and I both said we needed a few more days, but the real world beckoned so we headed back home on Sunday afternoon. Home where we had to turn our heat on. Boo. But happy for the memories made and for the exciting future awaiting the happy couple. Oh, I thought about you this weekend and just knew you were having such a wonderful time. Charleston is just the best. We ate at several of the same places you mentioned. We are dying to go back and take in more of the town. Glad you had a great time! We love Charleston! Have vacationed in one of those beautiful homes on Folly Beach, three times! We have also dined at 82 Queen. SO glad you had such a good time. I love shrimp and grits, too. Food really is the universal language!! Every time we come to Hilton Head, we swear we are going to spend some time in Charleston ... you've inspired us to make sure that it happens next trip! Wow! You did a pretty good job eating your way through Charleston! lol Nicely done. I'm glad you had this great weather - no humidity! It's coming back today. 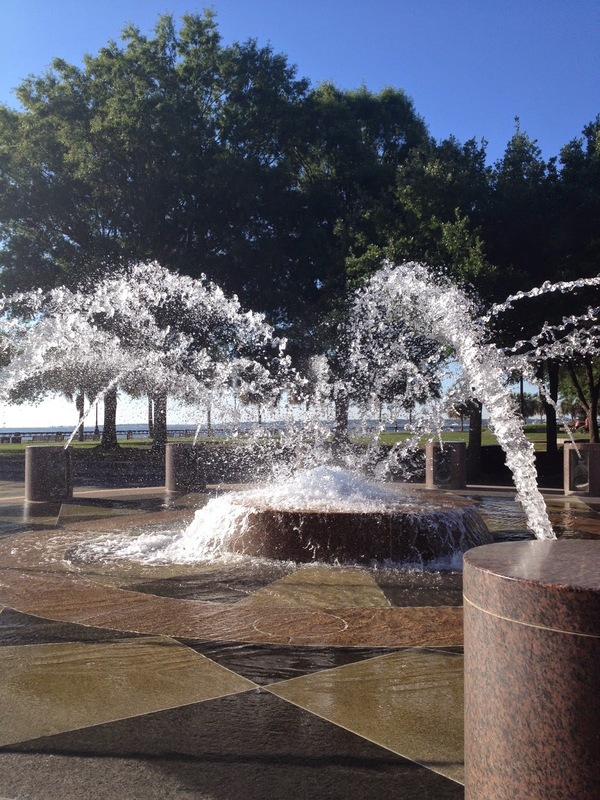 Did you happen to walk through the College of Charleston campus? It's just a few blocks off King Street and is lovely. When my Kristen was there I'd bop down for lunch with her, or some shopping. You can see why! I'm glad it was a beautiful weekend for you all. Next time you come to visit "Chucktown" let me know & I'll meet you for a drink! Charleston will definitely draw you in with its southern charm! So happy you had such a memorable time! Congrats to him on the graduation....M.D.....way to go!! Sounds like an amazing weekend, you were so busy and saw so many wonderful places. I think it is great that your getting to know his family.